Post-Vatican II Catholic young people are suffering an identity crisis, reports a new book Young Adult Catholics released by the University of Notre Dame. I would be amazed if this would come as a surprise these last thirty years to anyone – except for those ostriches who bury their heads to escape seeing the reality around them. Ignorant of dogma, distanced from tradition, the young Catholics polled in this study revealed their difficulty in articulating a coherent sense of Catholic identity. The good news: most of them like being Catholic. The bad news: most of them are not sure of what is distinctive about Catholicism. In focus-group sessions, researchers frequently heard young Catholics say, “It doesn’t really matter that much whether you are Catholic or not.” That is to say, many of them look upon Catholicism as just another denomination among so many others. And what are young people asking for? An article in the September 14 progressivist magazine Commonweal noted with some surprise that across the conservative-to-progressivist spectrum, young Catholics said they wanted better religious formation. Young people see lots of good will in CCD, but little substance. Many wrote that they had stumbled accidentally onto important Catholic traditions – chant, medieval philosophy, and French religious art. Why hadn’t anyone told them? One young woman described the situation of herself and her contemporaries very poetically: “We are a generation trying to write a dictionary of belief without words.” The bread that many Catholic youth are asking for is knowledge, understanding and familiarity with Catholic tradition and dogma. And what are they receiving? Social programs that emphasize community service and environmental activism. Religious education programs that emphasize ecumenism and a common heritage with false-religions, rather than teach what is distinctive about being Catholic and why that matters. 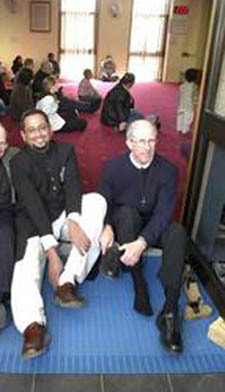 One after-effect of the September 11 crisis has been the stimulation of inter-faith prayer “meetings” between Muslims and Catholics. “In scattered locations across the country and around the world, Christians and Muslims are joining together to pray,” announced an article entitled “Seeking Peace as One.” I’m not sure what Christian means anymore. It used to be a synonym for Catholic. But today, the term is used to “embrace” every Protestant sect that claims Christ as Savior, with the aim of closing the distance between us and our “separated brethren.” In this case, however, it seems the word Christian is being used in its correct sense, that is, to describe Catholics. How can this kind of inter-faith meeting do anything but serve to confuse the already baffled youth? If statements like this (“The House of Islam is the House of God”) that conflict head-on with Catholic Church teaching are not corrected, how can young people know and preserve the sense of the unicity of our Holy Faith? In this kind of relativist environment, how can they avoid coming to the false conclusion that salvation is possible in all religions? They are asking for bread, and receiving stones. But the bad fathers who are giving their children stones “are only the progressivist Bishops, not the Vatican,” many blind conservatives respond automatically. I dare to disturb their comfortable sightlessness by asking them to hear, since they refuse to see, some facts. 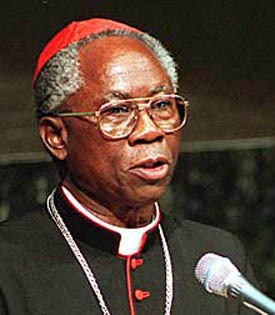 Ecumenical meetings like this have been encouraged by Cardinal Francis Arinze, president of the Vatican’s Pontifical Council for Interreligious Dialogue. This makes him the Church’s leading representative on how to relate to Muslims, Jews, Hindus, Buddhists, Sikhs, atheists and other brands of pagans. The Cardinal insists that interfaith dialogue has become more important than ever since the September 11 attacks. Dogmatic tolerance is self-contradiction. How can a Church that professes to be a teacher of truth say to their thinking youth: “If you believe in the Trinity, in the divinity of Christ, in the Sacraments of the Holy Eucharist and Penance, well and good. And if other religions don’t believe in them – again, well and good.” Thinking like this naturally leads to not only an identity crisis, but also religious indifferentism. Here in Los Angeles at a Catholic funeral Mass a good friend of mine recently attended, the Monsignor made a call for everyone in the Church – Catholics, Protestants, Jews and Muslims – to receive Holy Communion “because we all believe in the one same God.” This is not even objectively true. Neither Jews nor Muslims accept the divinity of Jesus Christ. But a kind of millennial ecumenical euphoria hovers in the air, bewitching everyone. No one in the congregation objected or appeared shocked. (Except for my friend. When she complained later to the Monsignor, she was chastised for her “lack of tolerance” and asked not to return if she had problems with this.) In fact, most young persons educated in the post-Vatican II parochial schools in the Los Angeles Diocese have been taught the supreme commandment of God is to be tolerant and open to other religions – the exact same tolerance that was preached by Voltaire and the Encyclopedists. In class assignments, Catholic students visit synagogues and mosques in the “spirit of the openness” of Vatican II. Comparative religion classes have replaced catechism classes in high school. Is it any wonder that the majority of youth today do not know the past teaching of the Church? Should anyone be astonished that after this non-doctrinal kind of indoctrination, many young people can even end by rejecting religion? But if they still feel a pull toward prayer? Don’t worry, says Fr. Hogen Bays, a Catholic priest, who teaches in the Zen Community of Oregon. Buddhism addresses that apparent contradiction. Buddhist prayer can connect us with what is greater than our small self, says Fr. Bays. After all, that’s what prayer is all about (Kansas City Star Magazine, Oct. 14, 2001). There is something for everyone today. Except the truth. Thus do young adult Catholics report an identity crisis in the post-Vatican II era. 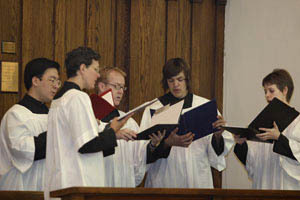 Religious education programs and interfaith services that emphasize ecumenism and a common heritage with false religions are leaving the youth with no notion of Catholic doctrine and the vague sense that the Catholic Church is just one way – among many others – to find God and achieve eternal salvation. I recall sadly a warning from an old catechism: If a creed (or a church) whose general spirit breeds an indifference to the religious education of the young, it is destined to reap a harvest of misdeeds beyond the reckoning of men and angels.